CAiSE 2015 is hosted by the Department of Computer and Systems Sciences (DSV), one of Sweden’s oldest IT faculties and the biggest department in Stockholm University. Research in DSV resides between technology and people. It is characterized by ongoing growth and linked to major paradigm shifts in the development and use of technology. Since 1990, DSV is located in Kista, Sweden’s hub for technology and telecommunication companies. Kista Science City is the natural meeting place for anyone working in ICT in Scandinavia. Hundreds of ICT companies are located here, including Ericsson, IBM, Oracle, and many other world-leading companies. 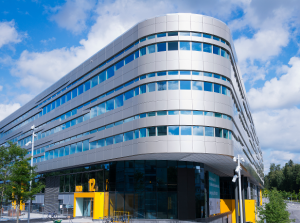 DSV moved in the summer of 2014 to the new NOD building, which is designed as a novel meeting place for learning, research, business, and culture, and with a focus on innovation and creativity. The academic presence enriches the technology environment in Kista and offers a meeting point for different actors and interests. The premises is inviting with lots of open spaces and light. Lecture and seminar rooms are equipped with the latest AV technology. Access to the wireless network Eduroam is, of course, available.